Don't you love bangles? I think they're so great. Layer a lot of them or just one big, chunky one. 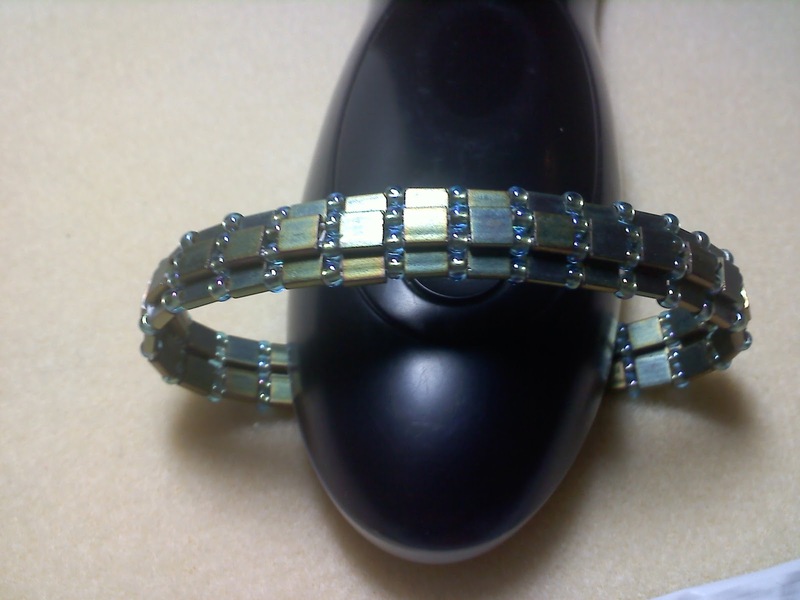 So comfortable, no closures to come loose and make you lose your bracelet, so versatile (dress them up or down). The blue bangle you've seen from my blog soup. It's wobbly and wavy and doesn't want to stay round. Not good. These two bracelets were similarly made. 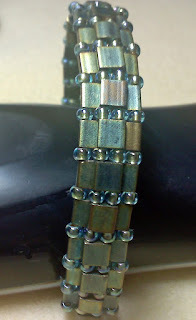 Make a base of peyote stitch in size 11 delicas, then (in the blue one) add a couple of rows of larger beads and zip it up. With the pink & white one, the same base in size 11 delicas, then switch to size 11 seeds. I like this better. (BTW, it's a pattern from Debbie VonTonder). But I saved the best for last. Can't really compare them because they're totally different but this last one I have to show you is (so far) my favorite and I totally made it up! 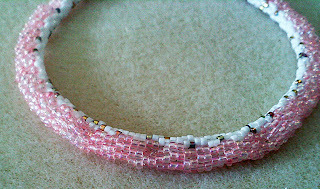 First I did one version with tila beads in 2 rows and a mix of seed beads. This was just okay. The mix of seed beads wasn't good because it made the tilas go all wonky. But I felt like there was potential there so I took it apart and then did this. I totally love it! This time I used 3 rows of tilas and plain size 8 seeds. I really love the feel of this. And it stands up by itself. Sturdy and metallic and totally awesome. Oh, and it's exactly the right size! This one has the tilas in a sort of tile arrangement, a little different from the first one. Which was do you think it looks best? I am just loving these and have to make more. 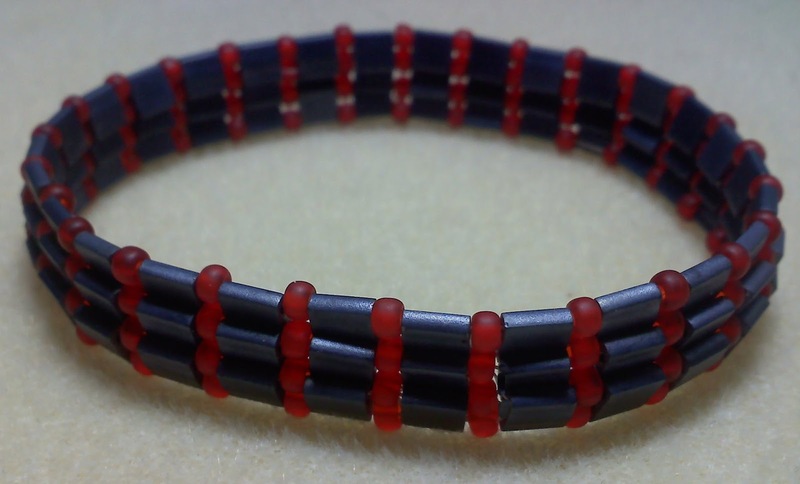 So I just placed an order for some more tila beads. WooHoo. Beady mail. Hope they get here soon, I'm so excited about this! Sally, I love the bangles, and that is a nifty trick, which I did not know about till now. Sally, you rock! Love those tila bracelets! I like both styles, they're really cool. And that's saying something, cause I haven't really jumped on the tila bandwagon. Not a huge fan of them. You know necessity is the mother of invention, right? That is a cool trick with the scissors, I didn't know it either! Excellent bangles and a wonderful trick. I shall use this in sewing when I've got to go through leather or multiple layers. As far as which bangle I like better, I like them both and love the reworked one but I like the texture of the red and blue one better. And I'll definitely try to remember the scissors trick! Dammmmnnnnn, girl! I can't believe you didn't tell me about these!!! Those tilas are amazing! Did you write up the pattern?? Are you going to hawk it on your blog?? You should! You must tell me about it, can't believe what I miss when I can't read my friend's blogs for a few days! The bangles are all so pretty (and you have been very busy making bangles). 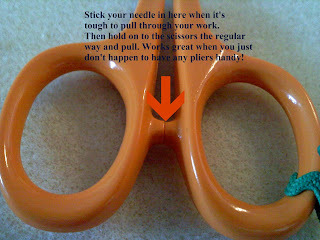 I love the tip regarding the needle and the scissors, it is new to me and I'll be giving it a try ... 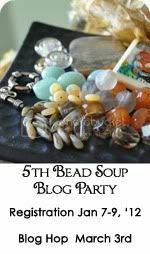 I always reached for my beading pliers (which weren't always close at hand). Bangles are totally awesome ...and great idea with the scissors! I usually run to get my beading pliers! DUH -never thought of the scissors! Love the bangles! Not tried Tila beads yet but this is the first piece I've seen made with them that has tempted me to give them a go. 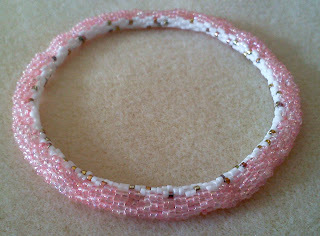 I especially love the 'tiled' bangle. Great tip too- gotta be better than chipping your teeth like I usually do! The top blue and pink ones are my favorites. That scissors tip is super helpful!